"The police have made it very clear where their allegiances lie," says DSA co-chair Olivia Katbi Smith. 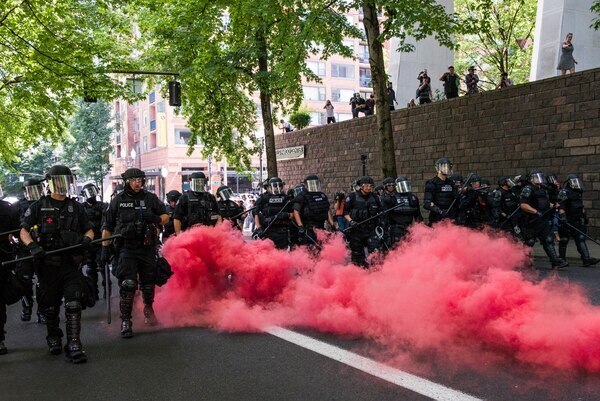 Portland police deploying explosives and chemical weapons on a crowd of antifascist protesters Aug. 4 drew widespread criticism and condemnation from civil rights advocates and political activists. Police deployed "flash-bang" grenades, pepper spray and foam bullets against protesters who showed up to oppose a far-right rally organized by U.S. Senate candidate Joey Gibson. The Portland Chapter of the Democratic Socialists of America and the Council on American-Islamic Relations issued a joint press release Aug. 5 accusing the police of "escalating" tensions and siding with Gibson's supporters rather than antifascist counter-protesters. "The police have made it very clear where their allegiances lie," says DSA co-chair Olivia Katbi Smith. "We cannot continue to allow our brothers and sisters to be targeted and intimidated while the police either stand by and do nothing or actively enable fascist organizing in our city." A woman protesting with left-wing groups told The Guardian this morning she suffered soft-tissue damage and third-degree chemical burns on her arm and chest. "I heard the most earth-shattering explosion," she told The Guardian. 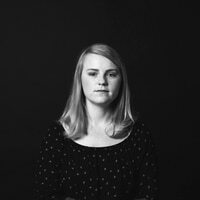 "I felt struck in the chest, then the arm, and then a really intense and searing pain." The use of force against the counter-protest was the most aggressive since the June 4, 2017, rally where police detained hundreds of counter-protesters for hours after kettling them and forcing them to show IDs before being released. Portland police directives allow officers to use so-called "riot control agents" when protests turn into "civil disturbances." But each use of force must be tied to a specific threat and officers cannot use crowd control devices simply because other officers have done so. Police Chief Danielle Outlaw initially defended her officers, saying that protesters had broken the law. "The Portland Police Bureau is, and will always be, committed to providing a safe environment for all individuals to exercise their First Amendments rights in a peaceful manner," she said in a statement on Aug. 4. "Unfortunately, today, some people chose to commit illegal acts of violence, which required members of the Police Bureau to take action in order to keep all participants and non-participants safe. This was a dangerous situation for all those involved, including officers, and I am disheartened that this kind of illegal behavior occurred in our beautiful city." But her tone changed after reports that police had hit multiple protesters with flash-bang grenades, sending people to the hospital with serious injuries. ""This morning I learned of allegations of injury as a result of law enforcement action," she said in a statement on Aug. 5. "I take all force applications by members seriously and I have directed the Professional Standards Division to begin the intake process regarding these allegations to determine if force was used and if so, was within our policy and training guidelines." She also said the Independent Police Review, a division of the City Auditor's Office, will review the use of force. An IPR review of a 2017 protest that raised advocates hackles after police used significant force against antifascist protesters but not against their right-wing adversaries took nearly a year and ultimately stripped out evidence that police had indeed approached Patriot Prayer with preferential treatment. Zakir Khan, a CAIR spokesman, echoed the criticism that police focused too much on the antifascists while allowing the Patriot Prayer supporters to keep weapons and disobey direct police orders without facing crowd control tactics. "Throughout the rally, Portland Police primarily focused upon protecting the alt-right groups' hate bias-motivated behavior, including escorting its members throughout the area and allowing an unpermitted parade to commence through the streets of downtown Portland after the rally," he said. "When alt-right groups repeatedly disobeyed Portland Police commands, there were zero consequences." The American Civil Liberties Union of Oregon denounced the use of force as emblematic of what it described as the Portland Police Bureau's outsized dependence on harsh tactics against left-leaning protesters. "The Portland Police Bureau's response to protest is completely unacceptable in a free society," ACLU of Oregon executive director David Rogers said in a statement. "The repeated use of excessive force, and the targeting of demonstrators based on political beliefs are a danger to the First Amendment rights of all people. 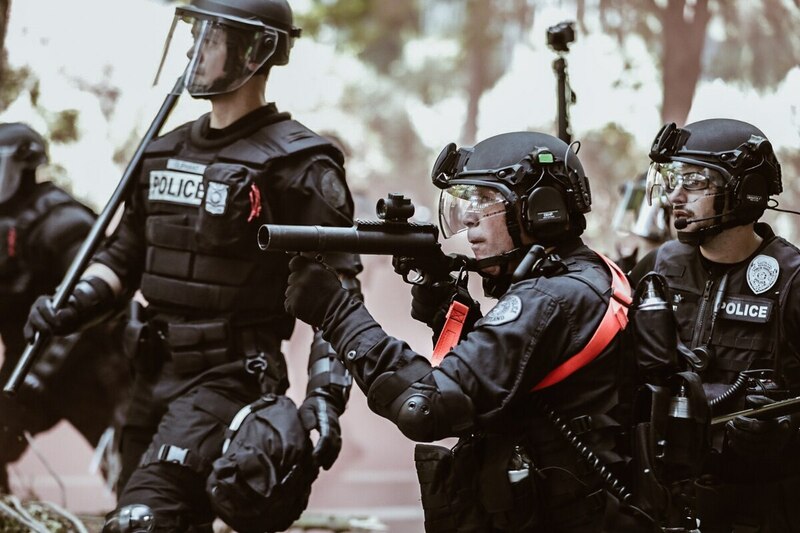 We call on the Portland Police Bureau, Mayor Wheeler, and Chief Outlaw to immediately end the use of weapons, munitions, and explosives against protesters."